The HoverCam CenterStage line of interactive flat panels all include LCD screens with LED backlighting. These two terms underline the quality craftsmanship of our panels and exemplify HoverCams mission of setting the standard for the 21st century classroom. First, let’s start with LED. LED stands for “light-emitting diodes.” They light up via the movement of electrons in a semiconductor material. 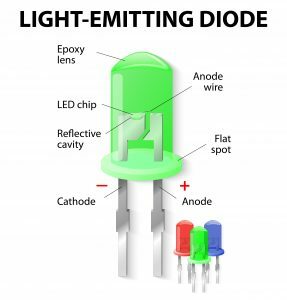 Voltage passes through two leads (anode and cathode) into the LED, then energy is released in the form of photons – this process is called electroluminescence. The color of the LED is determined by the wavelength and semiconductor material being used; i.e. for Red, the wavelength would be 620-645 nm through a semiconductor material such as gallium arsenide phosphide (GaAsP). Now that we’ve broken down the science, what’s so great about LED lights? Well, their lifetime can last decades in which they do not “burn out” but slowly dim, this is called lumen deprecation. They’re 80-90% more efficient than incandescent bulbs while they also emit brighter light. LEDs are cooler in temperature than incandescent bulbs which reduces combustion. This lower temperature also keeps from adding heat to other electrical components – such as those you’d find in an interactive flat panel display (IFPD). LEDs are also much smaller, so they can be quickly and individually switched while easily customizable into any design. LCD stands for liquid crystal display. LCDs do not emit light thus they require to be backlit; for CenterStage IFPDs we utilize LCD panels backlit by LEDs. LCDs are small crystals that exist in their natural, undirected nematic state, or to simply put it, they are twisted strings of crystals. These strings of crystals are responsive to electric currents and changes in temperature, thus the image they form is entirely dependent on the current conducted through them as the voltage dictates the shade of the RGB dots (the three subpixels that make up one pixel). Â When electricity is ran through these LCD strings, not only does the voltage determine the shades of the colors, but these twisted strings of crystals change their orientation which then allows light to pass through; this creates the final image displayed on screen. LED LCDs are the market standard for quality as they have greater longevity, the best resolution, are more energy efficient, lighter in weight, and are the brightest displays in comparison to plasma displays and CCFL LCD panels. In the HoverCam CenterStage line of IFPDs, we utilize LED backlighting, ensuring lower operation temperatures, quality and longer lifespans and LCD displays to create the most detailed image available on the market. This makes the CenterStage one of the smartest, most quality, and energy-efficient options on the market for an IFPD. When you choose a CenterStage IFPD, you’re choosing the best by joining a long line of customers who believe in quality for the classroom.